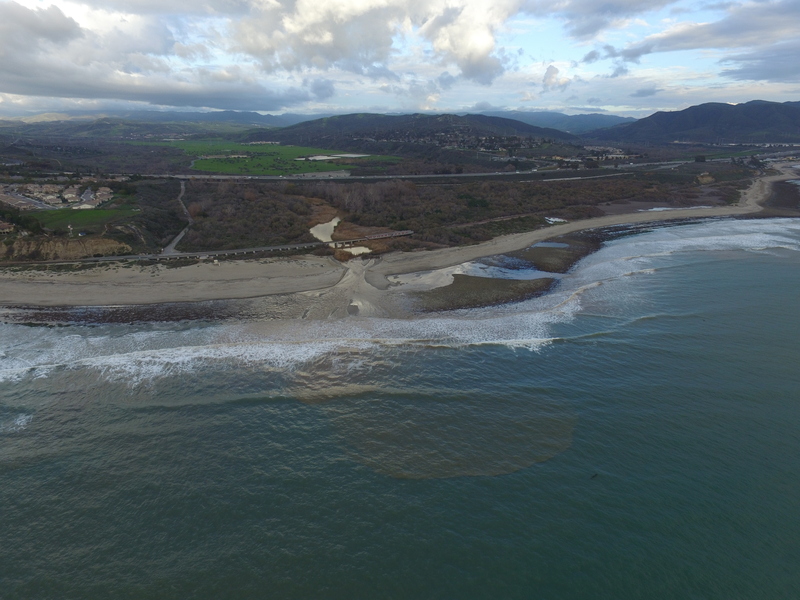 We may need to change the name of this site to “Trestles Shark Crowd” in the future. Over the last few years, the number of shark sightings has increased at Trestles and other local surf spots. Shark experts say the increase in sightings comes with increased numbers of sharks off the Southern California coast due to improvements in the local fishery. The good news is that after decades of efforts, the Southern California fishery has improved, reflecting a general improvement in many, though not all, portions of the local ocean environment. The bad news is that means surfers need to become even more aware of their surroundings while taking advantage of California’s many great surf spots. And, from time to time, we are going to see beach closures like other sharky areas of the world. In the evening on Saturday, April 29, 2017, a woman was bitten by a shark while swimming with fins in the shallows of Church, that classic surfing area at the mouth of San Onofre Creek in the San Onofre State Beach, at the northern edge of San Diego County. You can read more details in this Orange County Register article. This article references remarks by Dr. Christopher Lowe, a shark researcher at California State University Long Beach. Not only has Dr. Lowe been quick to remark in the past about the improvement of Southern California fisheries, but in this article he described to the reporter how El Niño conditions a couple years ago extended the amount of time juvenile sharks have stayed in local waters to eat and grow. Assuming Dr. Lowe is correct (and he is considered an expert for good reason), more shark sightings are likely just around the corner. The National Weather Service prediction center of the US National Oceanic and Atmospheric Administration (NOAA) predicted on April 13, 2017, that it is very likely an El Niño is going to form in Fall 2017. As the water warms and reverses the effects of ocean currents, it will also be more likely that hammerhead sharks will show up at Southern California beaches, heading north from their usual foraging areas in warm Mexican waters. And juvenile great white sharks will have less reason to head south to to those warmer waters after birth. So, they will be hanging out even longer off our coast, increasing the number of shark sightings. We are not predicting some sort of Sharknado, but we will likely hear more reports of shark sightings near our favorite surf areas. So, tune into Trestles Shark, er Surf, Crowd.com for more info in the future. At 3:00 pm today, the City of San Clemente surf report from the pier reported sustained winds of 45 from the southeast. That’s enough to grow waves locally. 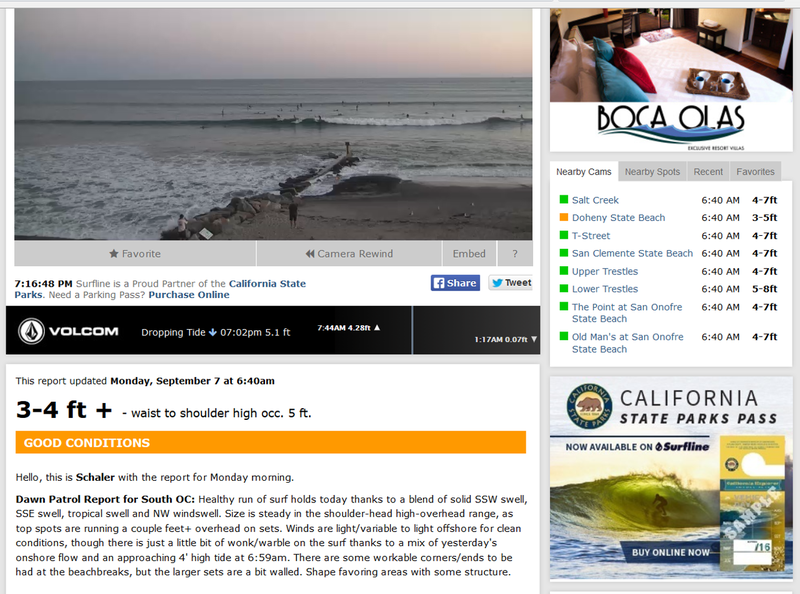 Below is a screenshot from Surfline.com’s T-Street webcam; and it is only beginning to build. The weather reports were predicting rain that would be the heaviest in the last 10 to 20 years (kind of a typical weather forecaster’s vague speak). At any rate, below is a screenshot from Weather Underground showing the radar imagery for what is headed this way. 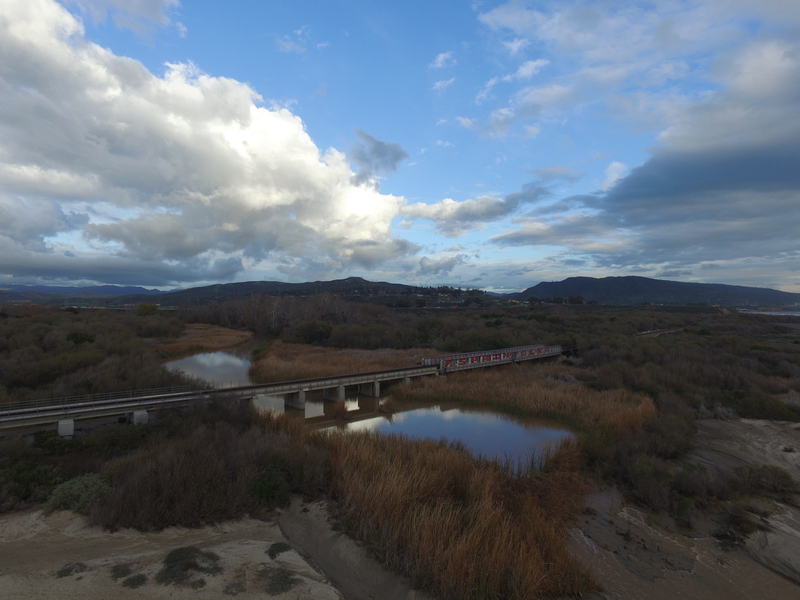 Lots of rain headed toward the headwaters of San Mateo Creek, our favorite Southern California pristine watershed that flows out to the Pacific at Uppers. The bottom has already changed this season, with more to come. It should set up some great waves by the time the summer south swells show up later this year. In the meantime, maybe California is finally limping out of its long drought. 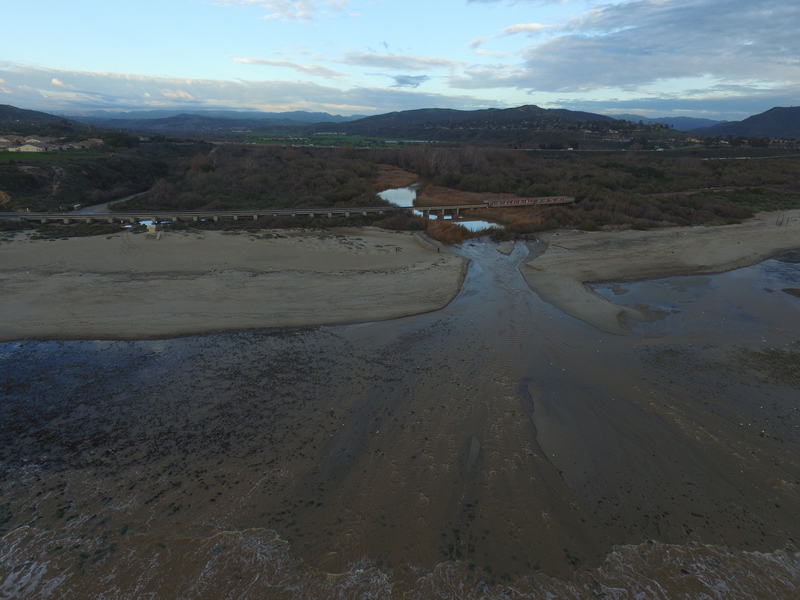 The El Nino winter last year fizzled out with no real rain, even though all the experts predicted heavy precipitation. It may be that if you look at the last several El Nino events, the heavy rain doesn’t actually show up until the first rainy season after the sea surface temperatures return to an ENSO-neutral condition. 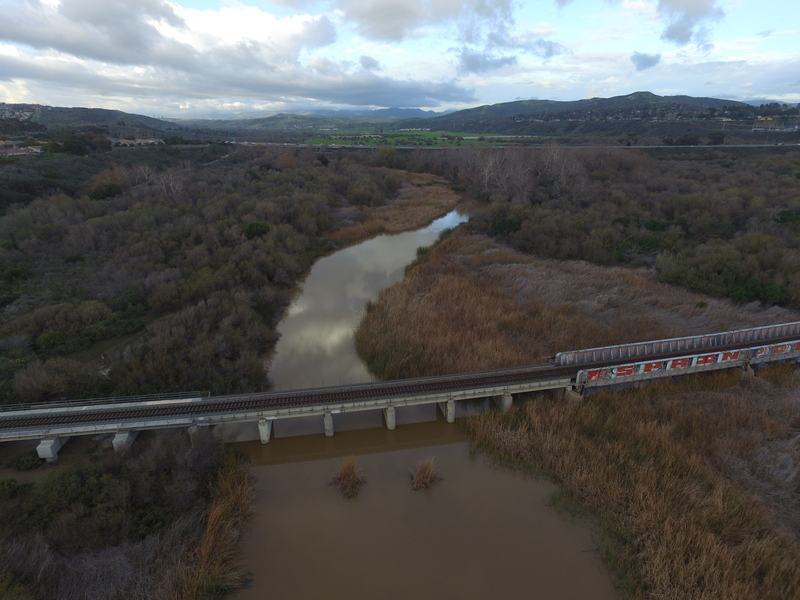 Regardless, it’s great to see the San Mateo flowing with life again. Rain, rain, don’t go away. In what can only be seen as a wink and nod to its fiercest critics, the World Surfer League (WSL) has adopted a new contest format for its cadre of professional wave riders. It’s called the “scrum” format. So, here is how the scrum works. At 4:30 am, all 34 pro contestants simultaneously receive a text message on their phones telling them the scrum is on, along with the wind and buoy reports. They must then race to the Cristianitos parking lot, drop their bikes, and ride like crazy down the trail to the beach. 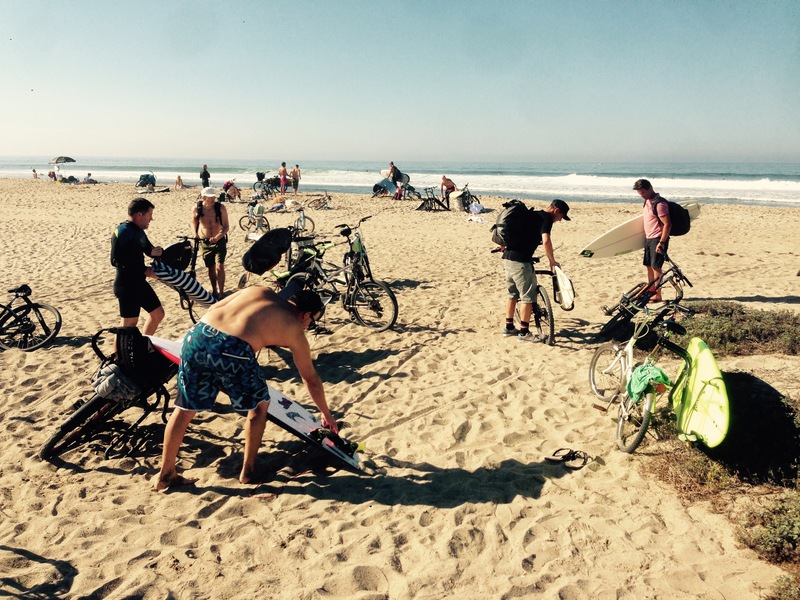 Those who happen to live closeby can ride their bikes directly to the beach. But, no headlights allowed for anyone. There is only a single 3-hour heat, all in. Last man (this is the men’s contest) standing wins. They can bring their best game faces, but the rules are the local rules. No such thing as priority. You’ve gotta earn it through tactics learned through years of experience. Mad-dogging, blocking, shoulder hopping, back paddling, rail bumping; it’s all legal, if you can get away with it. Some of the new contestants will try to work their way to the peak by giving a few set waves to the veterans, hoping for some scraps or nuggets. They may even try chatting it up with the vets, but there is not much hope for the nice guy approach in the scrum. Longboards are allowed, but are generally discouraged. That is the scrum. Sound familiar? 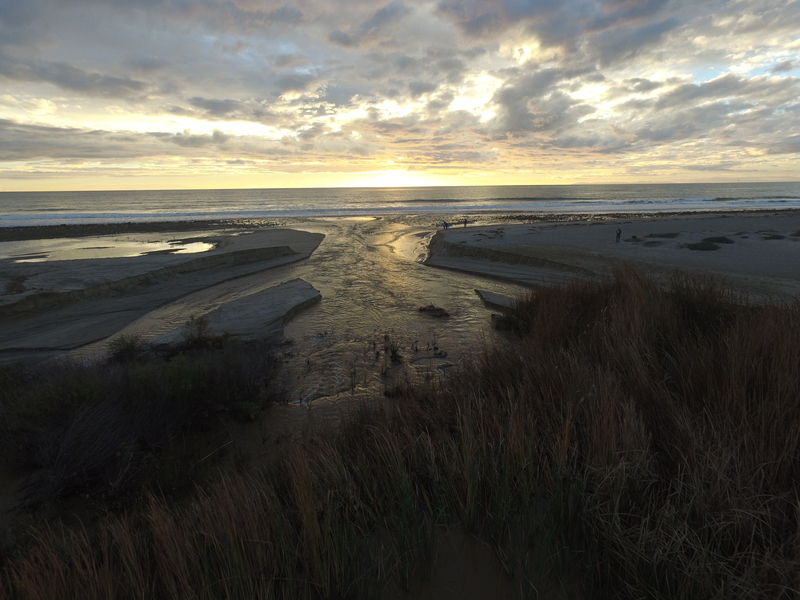 Here is a photo, courtesy of the Surfline Lower Trestles live stream. Scrum in progress. Anybody keeping score? We hope you enjoyed this fictional story about a zany idea that has no basis in fact or any relationship to any real surf industry persons or organizations. It started with a full parking lot by 5:45 am. Followed by full Cristianitos Road street parking by 6:00 am. meaning the crowd was not spread out temporally (ie, the surfers who caught the previous set of waves have enough time to paddle back out to the lineup before the next set). There were at least 100 people in the “slot” at Lowers, from the guys acting as “indicators” on the outside to the groms on the inside. It was possible to get some boomers to yourself, but you had to paddle for a lot of party waves first. Warm water, mens and womens pros sprinkled through the crowd, and lots of competitive juice flowing through everyone. Got about 10 waves, then paddle, paddle, paddle to . . . Even more people, though they were spread out from Barbed Wires to the Bay. Definitely some sneakers coming through. Swing, stab, and go. It was also a little more consistent than Lowers this time. Lots of waves, but lots of surfers. Nice long rights, with lots of speed and energy. Sometimes the walls would gobble you up. That’s the Trestles report in a nutshell. But, there were waves everywhere along the coast. I thought Kayo was crazy peddling back to his car at 6:00 am, mumbling something about checking out Doho. Looking at the Doheny camera this evening, now I see what he was talking about. Check out this report from Surfline; only “good” rating on the coast. Hmmmm. Everyone is getting pumped up for the 2015 Hurley Pro at Trestles, with its window being from Wednesday, September 9 through September 20. Parking will be interesting. For those planning to attend the event, you likely won’t be able to find parking at the Trestles lot near Carl’s Jr. It will be full by about 6:30 am at the latest due to the swell. So, just follow the event signage to the official parking area. That will work best for everyone, surfers and spectators alike. With that said, do plan on attending the event. The lineup is incredible this year for both men and women. And, it looks like there will be waves throughout the entire window, though they may vary in height a bit. Weather is perfect as well. What an idyllic place to enjoy some of the best surf and surfers in the world. Welcome to the Crowd, where respect is mutual and expected. That’s the report for this week. Surf’s up!